This week I traveled to San Jose with a client for ACI-NA 2013 - a conference for the airport and aviation industry. I was certain that it would give me excellent content for my blog post, and it did. There are so many innovative and new technologies flooding into this space, and it’s an extremely exciting time for the industry. But, the end of my trip actually gave me a different idea; that I feel very connected as well. So, while I could go on and on about the aviation industry, I am re-routing slightly. Instead, something that stuck out the most to me during my trip to the other coast came on a drive from San Jose to San Francisco, and I couldn’t shake it. In Atlanta, we often hear about the wonders of Silicon Valley and all the money that is poured into that region and the technology companies coming from that part of the U.S. But as I was driving along the highway, seeing every logo you could possibly imagine, screaming at me from the tops of gigantic office campuses - Google, Microsoft, eBay, Paypal, Oracle - I didn’t get excited. Now for a self-proclaimed geek, I was personally shocked that I felt this way. I thought there would be a glimmer in my eye seeing all these buildings and being in the heart of it all. But it dawned on me: I know these companies and brands. I use their products daily, usually without consciously thinking, "My laptop is powered by Intel." They’ve become so ingrained in my day to day life that they are no longer magical or special. I’m so thankful for what the Silicon Valley tech hub has brought to our society, but what really excites me now is Atlanta. As I was driving through Cali, all I could think about was, "I can't wait to get back to my city." What’s going on in our backyard truly excites me. 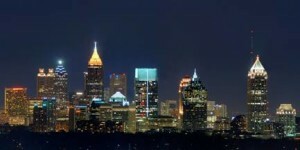 Atlanta has evolved into the innovation hub of the South. With a countless number of start-up incubators and experts supporting our local entrepreneur community, I know the great things coming from the peach state will continue. The list could go on and on – from Atlanta Technology Angels, Atlanta Technology Village and ATDC to the entrepreneurs who are driving growth and excitement, such as InsightPool, Innovolt and VoAPPS. It’s impressive what individuals and organizations are accomplishing here every day. So cheers to you, Atlanta. I'd pick you any day over the west coast. And I’m so happy to play even a small role in what we’re doing here.